This building was erected in 1875 as the grocery and general dealers’ shop of the wealthy Eames family. They had been enticed to Llanfairfechan by the Platt family, which had bought the Bryn y Neuadd estate in the 1850s and set about transforming Llanfairfechan into a high-class seaside resort. After persuading the railway company to build a station in 1860, the Platts and Richard Luck, of the Plas estate, developed Station Road and Village Road. The local shops were focused initially on Village Road. The Eames family had become rich through trading in Amlwch, Anglesey, when large volumes of copper were shipped through Amlwch port. Copper was fitted to the undersides of wooden Royal Navy ships, to protect them from marine worms and prevent weeds growing on the wood. When iron warships came in, Amlwch began to decline. The Platts, seeking to establish a high-quality store in Llanfairfechan, saw their chance and persuaded the Eames family to move. Charles Henry Wynne, grandfather of local historian and councillor Andrew Hinchliff, became head grocer in 1904. In 1916 he went to France as servant to Sydney Platt of the Royal Flying Corps. Sydney was killed and Charles was gassed, the early airstrips being just behind the front line. Charles returned to the Eames’ service after the war, but his health never fully recovered and he died in 1941. 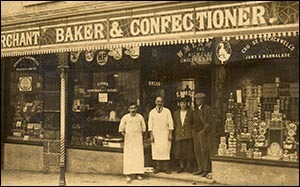 He is second from left in the photo of the shop front in 1925. The photo below shows him in his RAF uniform c.1918 (both photos shown here by kind permission of Andrew Hinchliff). Sydney’s close friend Valentine Baker, who also grew up in Llanfairfechan, became a flying ace during the war. 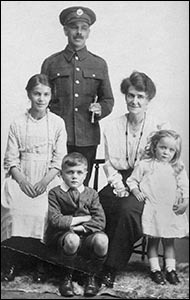 He married Dilys Eames, of the shop family, in 1916. The Eames grocery business traded here until the end of the Second World War, when it was sold. The shop continued as a grocery store until the late 1950s. The building was later sold to Caernarvonshire council and became a library and three dwellings. Conwy County Borough Council sustained the library until 2014, when a community library group took over.